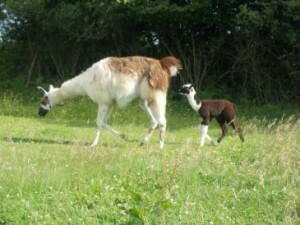 Our baby huarizo (llama-alpaca cross – see yesterday’s post) has a name. Caiti chose Fionn McCool, which is the name of the famous Irish giant of legend. It suits our little lad very well I think. Here’s a lovely photo Caits took of him yesterday (on the Blackberry Tablet she won in a web design competition – it takes excellent pictures). Fionn finally dried out this afternoon. He’d been damp since being born, firstly from sloshing around inside mum’s amniotic fluid for eleven and a half months, and then from the damp drizzly weather. But since it was warm, it wasn’t a concern. I took a towel out this morning to dry him off but he was skipping around happily. He seems to get confused between Katrina and Lulin sometimes and starts trying to suckle the wrong one, but Auntie Lu isn’t impressed and sees him off with a gentle neck bump. And the occasional spit. Poor little Fionn! Katrina has loads of milk for him. I did some investigatory llama milking yesterday and each touch of a teat brought forth a fine stream. 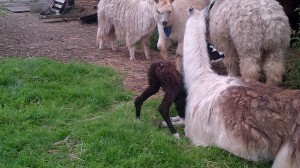 Llama and alpaca teats get a waxy coating on them which can be too much for some cria (baby camelids) to remove but Fionn had clearly managed. Unrelated news is that our swimming season has started properly. We’ve solved our pool problems and it’s just about full now. It’s a tingly 20 degrees C but Rors and I are braving it a couple of times a day for an invigorating swim. It’s starting to feel like summer. Caits has just two more days of exams left, and tough ones. It was English today so that wasn’t too much of a challenge. However, she has to remember to use French English and not English English. The latter version can sometimes lose you marks in anglais homework and exams as she and her brother have found out! Meet Our First Huarizo! France Still In Voting Frenzy: Who Will Be Next Président of the Assemblée Nationale?